"Our application required a flexible, accessible property grid with a rich feature set beyond what is offered by the WinForms PropertyGrid. We found the Smart PropertyGrid to be an ideal and cost-effective solution, and we received outstanding integration support. The SPG demonstrates the excellence and vibrancy of the .NET community." As you can see, it takes the "v" character followed by the max frames count. Even a floating number can be used, like 29.97 for NTSC. Note that this comes from a feature request received on July 16. I found it so useful (being a video editing fan myself) that I decided to work on it. The SFPE framework is so nice to use that I published the final result on July 23. Knowing that I had to work on other stuff as well, this surprised my customer who then sent one of the testimonials you can see on this page. Update: SFPE 1.2 has been released. It is not demonstrated in this video, but I remind you that this editor can be used in the DataGridView and in Smart PropertyGrid.Net too, and with the exact same features. If you have any question about this editor, just drop me a note here, in the forums or through the helpdesk. You will be able to play with it very soon when SFPE version 1.2 is out. It seems there is no TimeSpan editor for .Net. Can you believe it? 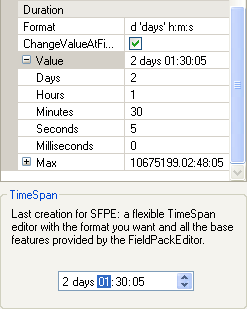 So when a customer asked me if it was possible to make one with Smart FieldPackEditor.Net, I realized I could fill a gap with a full featured duration editor, based on the flexibility of SFPE. And this is what is coming in version 1.2. Update: a screencast has been published. It can be used standalone, in Smart PropertyGrid or in the DataGridView. In the last case, the column of the grid can have the timespan type, long type for ticks and double type for seconds). Min and Max values can be set. The most significant field has no max value (except as specified by the global max value set), so you can have a value of 24 hours and more if needed. Updown button can be displayed. 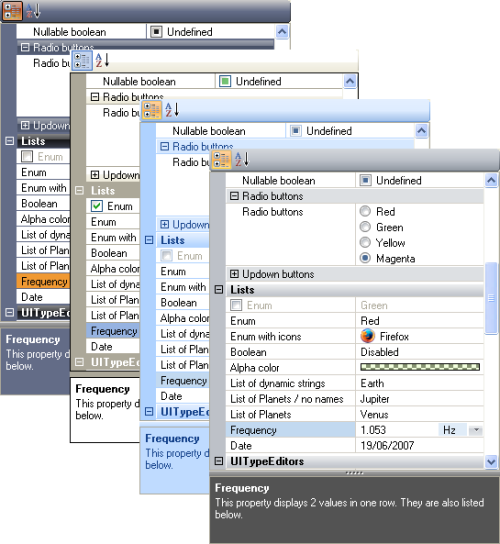 Nullable (with delete key or checkbox). Auto-incrementation can be switched on (for ex, seconds passing from 59 to 0 will increment minutes, and so on). A new FieldAdded event allows you to modify a field on the fly, for example to change the “day” static string to the plural “days” depending on the current value. This new editor is a free addition to Smart FieldPackEditor.Net and is planned for release in a few days. A screencast will also be published next week. This is feasible thanks to the Krypton Toolkit API (which is a free framework available here). Instead of reinventing the wheel, I contacted Phil Wright to learn more about his toolkit and I learnt that his assembly could be used only to skin custom controls. So I have just created a custom SPG drawing manager: KryptonDrawingManager.cs. It uses all the known themes of the toolkit and you can even design your own palettes. Screencast: How to visually synchronize two PropertyGrids? The synchronizer class can be downloaded here (please, let me know if you find any issue with this class, I will be happy to fix it). As promised, here is a screencast demonstrating the various ways to attach and show an icon with a property value. A convenient latitude/longitude editor has been added to wrap LatLongFieldPacks. What makes it exceptional is that it accepts values as float, double, decimal and corresponding nullable types and it can even be given your own latitude/longitude type as long as it is IConvertible to decimal or an attached TypeConverter can make the conversion. The latitude/longitude editor has a new inplace control for Smart PropertyGrid. The latitude/longitude editor can display its value as deg.fraction, deg min.fraction or deg min sec.fraction, with the fraction being optional. The IpAddress editor has a new inplace control for Smart PropertyGrid. It can be attached to a string or uint property type. Field.Readonly is now handled (behaviour and ForeColor). A ReadOnly field can still be selected. If you don't want so, just set Field.Selectable to false. DateTimeCustomFormatConverter has been set to the DateTimePicker.CustomFormat property so that it lists all standard format strings. There is now a simple way to set any field pack to accept the delete key or not, to nullify its content. Call the AcceptsDeleteKey property on the supplied editors or more specifically on individual field packs. The SpgSfpeAdapter also provides an attribute (FieldPackAcceptsDeleteKeyAttribute). The visibility of the checkbox, updown and dropdown buttons can now be set through the look class in Smart PropertyGrid. A month name field can now be edited with a numeric value (typing 2 will give february). Jumping to the next field can now be done with the blank key or the first letter/sign of the adjacent static field. When an editor was inside Smart PropertyGrid, its value was not commited if the user was in the middle of typing in a field. The up/down buttons were not effective when the user was in the middle of typing in a field. Better detection of a separator in the datetime format string. There was a problem when the user was typing a separator char prefixed by another static field. 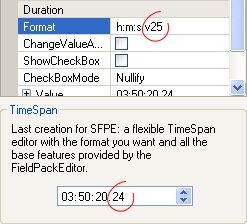 In an editor showing the time in 12h format with an AP/PM designator, changing the hour field could incorrectly change the AM/PM designator. Then management of the temporary buffer used while typing in a field has been enhanced. Here is a new screencast showcasing these two new features. Now, SPG has nothing to envy to the Microsoft PropertyGrid anymore. It is good to be lazy sometimes so I decided to add some lazyness to SPG. So far, simply to keep it simple, the grid was recursively loading all properties of a target instance. It has been reported that it could be costly for large contents or even worse it could lead to a crash if there was a cyclic property path. The Microsoft PropertyGrid was able to handle these situations so there was no reason to let SPG behind. That's why I added a LazyLoading mode where child properties will be loaded only when a parent is expanded. Icons in front of property values are now consistently managed, which lets you add any descriptive or status information with a value. You have many options to choose your image: it can come from a global image list, a property specific image list (usually when the property publishes standard values) or directly from an image reference. The next feature comes from a single customer request but I found it so smart that I was sure everyone would love it too. This is incremental search (aka auto-complete) which enables you to quickly set a new value to a property when it publishes a set of standard values. The original idea here is that you get this feature in textboxes, in dropdown lists and even in existing UITypeEditors (like the ColorEditor) when listboxes are detected. This is a terrific usability feature for your customers! I never was interested by this feature but many of you were asking for it and now that it is implemented I am not unhappy to see it in action. SPG, like the Microsoft PropertyGrid before, now displays non default values with a bold font. A value is "non default" when it's different from the one that is registered with a DefaultValueAttribute or when a ShouldSerialize method exists and returns true. You found that the alpha color picker was a nice addition to SPG but you were concerned by its "private" nature. Well, you can now derive from it and override many virtual methods. Choosing to show the alpha component or not is also a built-in feature. All these major features are showcased in the modified supplied sample. To see the full list of enhancements and fixes, simply consult the changelog. SFPE 1.1, which is already in beta, will be officially released. I will often post here to explain what's new in both products. Expect some screencasts inside. At one point, a FAQ/tips section will be opened.